While visiting my older sister a few months ago, she held up my archaic ‘Monday, Tuesday, Wednesday etc’ daily pharmacy plastic pill case one morning, shook it, looked at me and asked in mocked horror, “Um, how old are you?” I grabbed my giant case back and explained, yes, I take a lot of supplements, but for good reason – I turned thirty this year. It’s just the reality that everything is a little less bright and a little less tight. Layering on highlighters and makeup is one way to get “it” back, but I’m finding as I get older the best way to attain the glow we’re all after is a healthy body; also known as sleep, hydration, eating right, exercising and supplements. So, when the recently launched custom supplements monthly subscription company, Care/of, asked if I would review their product, I jumped at the opportunity. Care/of is everything my geriatric pill case is not: hip, efficient, custom, delivered to my door every month and Instagram-worthy. Millennials get ready to eat your heart out. After a five minute online test, that probed deeper than my regular physician does, Care/of explored and prioritized my health goals, digestion, cognitive concerns and skin concerns. A list of expected and unexpected supplements were recommended based on my answers and their research-based algorithm created by Care/of’s medical advisors, from Harvard and Northwestern. While a few recommendations seemed standard, like the fish oil, calcium and probiotics, I was surprised by their high quality sourcing. (Because let’s be real, not all supplements are created equal.) The brand’s fish oil is cold pressed, the best method for extraction, and derived from wild Alaskan salmon, and their calcium combines Icelandic minerals with Vitamin D and Vitamin K. Even the probiotics, which are also made in house, use a patented technology and fermentation. We’re talking high quality here, ladies and gentlemen. Astaxanthin, a powerful skin boosting antioxidant and carotenoid, and Bacopa, an herb used in Ayurvedic medicine to support cognitive function, were the unexpected ones. Both supplements I never would have thought to take on my own. Six different supplements in total were recommended to me. Though, I had the ability to remove supplements from my packs to adjust the cost, I opted to try their recommendations. My bespoke packets priced out at $66 per month, which seemed a little pricey at first, but when I priced out the cost of buying a month’s supply of each individually on Amazon I was shocked to find the cost landed around $85. Okay, so tailored to my specific needs; good. Cheaper and easier than buying separately; even better. 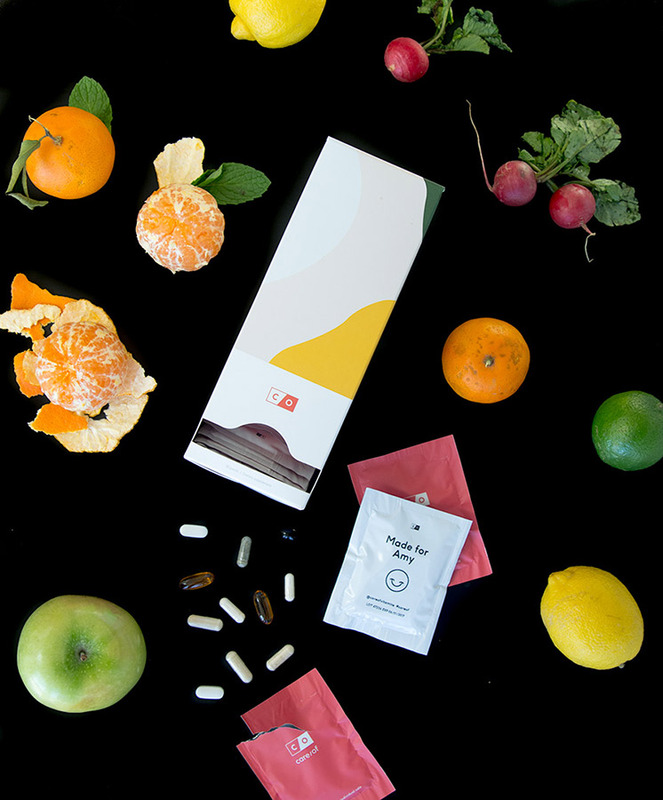 Within a few days my month’s supply of brightly colored, customized packets of supplements arrived in a countertop-worthy standing case. Bye, bye ugly plastic pill case, hello custom supplements cute enough for my purse, desk and Insta-stories. Once I got past ogling the gorgeous design, the functionality had me equally smitten; The individual packs are easy to store, travel with and most importantly easy to remember to take. Over the past few years I’ve been spotty with my commitment to taking supplements. But once I turned thirty and the fantasy of eternal youth was shattered by reality and I learned about depleted soils during an interview with Dr. Andre Berger, MD, founder of premiere Beverly Hills anti-aging practice, Rejuvalife, I’ve become religious about taking them each morning. If you’re like me, you are probably thinking – uh, depleted soils? Don’t worry, you’re not the only one in the dark. Unfortunately, according to Dr. Berger it’s a subject most consumers don’t know about because it’s information not readily measured or available. So, if you’re looking to incorporate supplements into your routine, but not sure where to start, I recommend checking out Care/of’s customizable approach. I love how they remove the hassle of going to the store, researching which pills to take, and fumbling around with an embarrassingly unattractive plastic pill cases. The brand was generous enough to send me my first month free, but I loved the ease and custom approach so much, I signed up for my monthly subscription to continue! 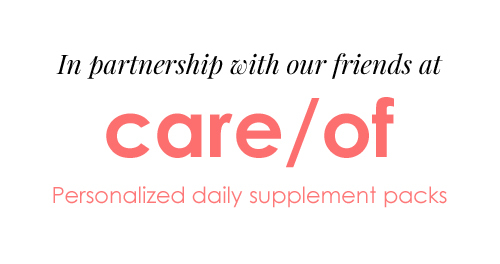 Care/of was awesome enough to offer BOND EN AVANT readers 50% off their first custom supplements order. Go to takecareof.com to place your order and use the code BONDENAVANT.